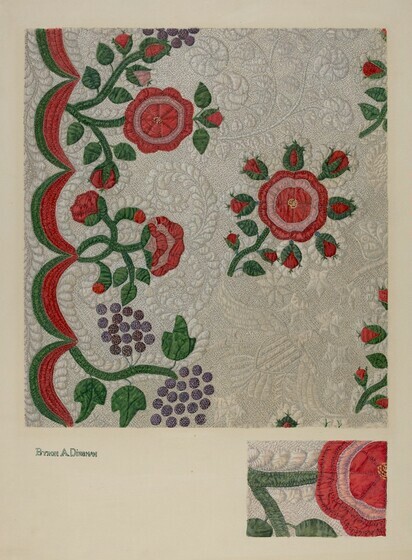 A variety of textile textures were produced in America during the eighteenth and nineteeth centuries. 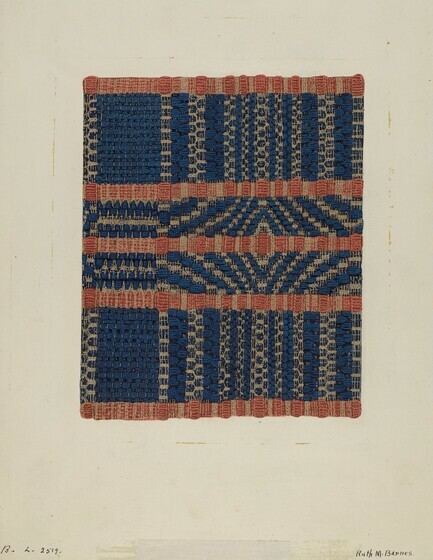 Included are representative examples of the handiwork of American women of colonial and later times, articles made by professional weavers, as well as fabrics produced by textile mills in America's early years of industrialization. In colonial times, the home was the center of textile production, which began with the sowing of seed for flax and the raising of sheep for wool. Long hours were spent in preparing the fibers, spinning them into yarn, dyeing or bleaching the yarn, and then weaving the fabrics needed to clothe family members and to provide the basic material for bedding and other household articles. Home-woven fabrics, like this piece of linen, were called homespun, and were generally plain in weave. Although early fabrics were often of only one color -- being woven from either bleached linen or wool, or from yarns dyed with colors derived from common garden plants and trees -- some American women enlivened their products by using combinations of colored yarns to produce handsome designs. Simple geometric patterns could be created on home looms; thus, striped or checked designs, as seen here, are a common feature of homespun fabric. Although American women continued to weave articles for their families, by the late colonial period, much weaving was done by itinerant professional weavers. Woven coverlets, or bed coverings, were, perhaps, the most handsome products of both the housewives and the journeymen weavers. From the late seventeenth century until about 1850, overshot coverlets like this example were popular. The overshot weave was relatively simple, though more complex than the plain homespun weave. There was one warp yarn, usually a two-ply linen or cotton, a binder weft yarn in the same material as the warp, but often single ply, and a pattern weft, which was of colored woolen yarn. The term "overshot" means that the supplementary weft patterning thread is "shot," or floated, over the plain warp threads, creating areas of solid color that stand out above a plain supporting weave. The overshot weft threads, seen here as a combination of blue and red yarns, create variations in texture as well as pattern and produce the lively geometric surfaces that are characteristic of overshot coverlets. 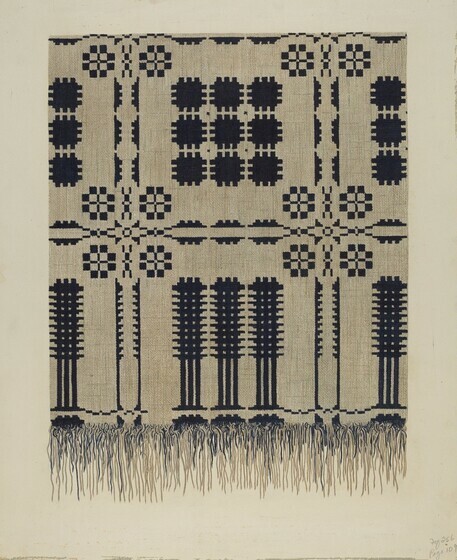 The patterns for these coverlets were largely traditional and were based on written drafts, or pattern guides, brought to America by European, English, and Scandinavian settlers. These drafts resemble musical notations, and, appropriately, the coverlets woven from them are, like this example, strikingly rhythmic in design. Here is a variation of the overshot weave. This coverlet is in the "summer-winter" weave, said to have been brought to America by the Pennsylvania German settlers, who used it frequently. Though more tightly woven than some overshot coverlets, the "summer-winter" weave pattern also depends upon weft threads floated over and under the structural weave. By alternating floating elements, a reversible fabric is formed. Notice that the corner of this coverlet has been folded back to reveal the light or "summer" side, which corresponds in pattern to the contrasting dark, or "winter" surface. As in other overshot coverlets, blue and red, combined with white or neutral yarns, dominate the design. Blue was frequently used in weaving, as in the indigo plant, from which the dye was made, was grown domestically and thus was readily available. In addition, imported indigo was sold inexpensively in shops and by itinerant peddlers. Second in popularity were reds, obtained from such common sources as sumac, madder roots, cherries, pokeberries, and the bloodroot plant. Another type of woven coverlet is the double weave, or double cloth coverlet, a detail of which appears here. Most coverlets of this type were made between 1725 and 1825. 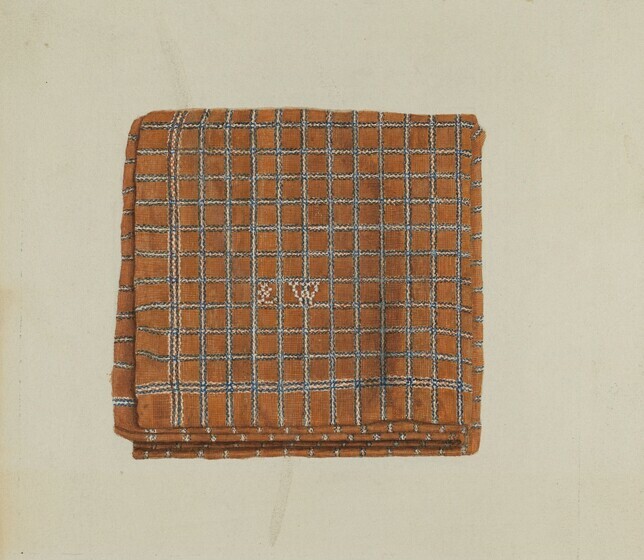 Double weave coverlets were woven with two sets of warp and weft threads, resulting in two separate pieces of cloth interwoven at certain points. The double thickness made these coverlets heavy and particularly well suited to cold climates, where extremely warm bedding was a necessity. Unlike other woven coverlets, which had cotton or linen warp threads, wool was often used for both warp and weft in the double weave structure. The designs of double weave coverlets were generally geometrical and frequently featured a pine tree border. Notice that the border here is composed of a triple pine tree configuration. In these coverlets, the pine tree motif is often combined with a snowball design, as is evident here. The most colorful and complex of the woven coverlets were those made on looms equipped with a Jacquard attachment. This device, invented in France by Joseph Jacquard in 1801, contained a series of pattern cards, punched through with holes through which the threads were guided. Mounted on an existing loom in place of the conventional heddles, this mechanism allowed each thread in the warp to be separately controlled, thus making possible an almost unlimited range of patterns and variations in design. The Jacquard attachment was introduced in America in the 1820s, resulting in the production of innumerable elaborately patterned coverlets. Here is a detail of a Jacquard coverlet made in Bucks County, Pennsylvania. 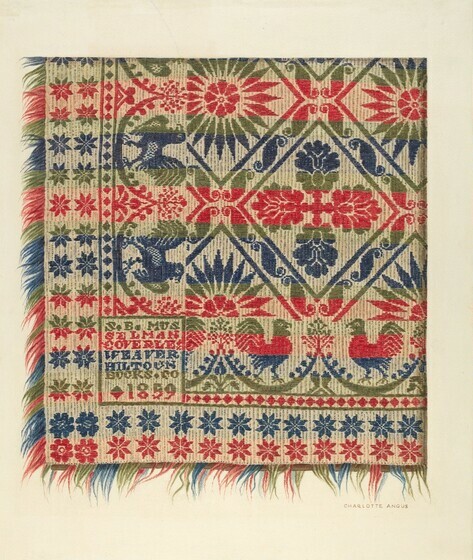 While patriotic symbols, such as the American eagle, were frequently featured in Jacquard designs, this coverlet retains traditional Pennsylvania German motifs in its stylized tulips, roosters, and stars. Woven inscriptions often appear at the corners of Jacquard coverlets. Here the weaver has followed the common practice of including his own name and that of the owner, the date, and the name of the county. Although many articles were woven at home throughout the eighteenth and nineteenth centuries, professional weavers and itinerant journeymen relieved American women of many of these chores. Housewives could think beyond providing the sternest necessities to adding touches of grace and luxury to their homes. For this, they turned to needlework. Needlework was a practical necessity from colonial times onward, for clothes and other articles had to be made, marked, and mended. Yet, for American women, needlework was also a luxury that permitted them to embellish their homes and to express their love of beauty. Moreover, needlework provided an opportunity to preserve the decorative traditions brought from their native lands as well as a means for displaying their sewing skills. Proficiency in needlework was commonly demonstrated in samplers made by young girls when, in the course of their education at home and at school, they had mastered the art of embroidery. The earliest samplers were actually collections of different stitches and served as needlework guides. By the mid-eighteenth century, samplers had become showpieces. They generally included a central scene, several types of alphabets, quotations from the Bible or pious verses, the maker's name, the date, and her age. 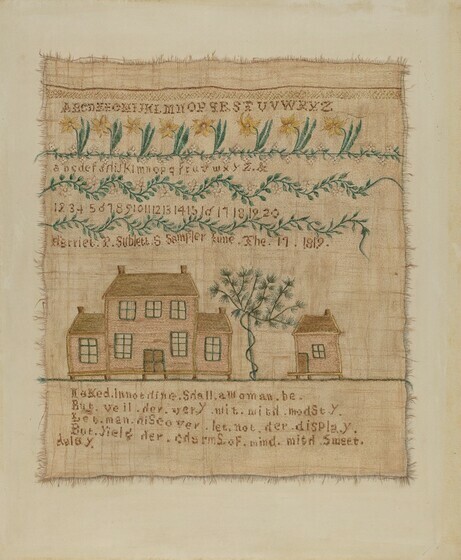 Here a young seamstress had used silk embroidery on linen to depict a house, possibly her own, and outbuilding. 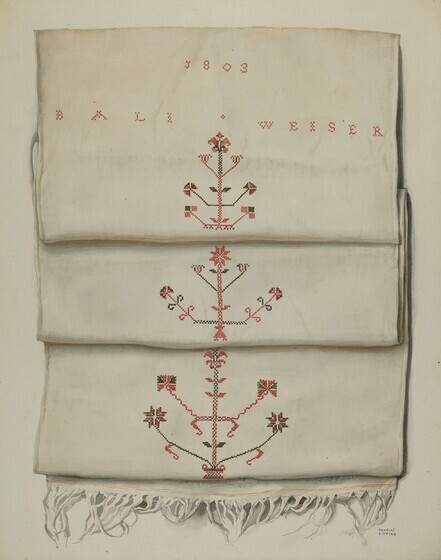 A variety of stitches are demonstrated in the pictorial forms, and still others compose the rows of flowers and plants that separate the alphabets, numbers, and biographical information. Samplers like this were proudly displayed by the girl's parents and, after she married, in her own home. Women lavished much attention on show towels, embroidered panels hung over the ordinary towels used by the family or otherwise displayed as decorations on doors. Show towels were most frequently made by Pennsylvania German settlers, who brought to America their European traditions. The practice of concealing homely everyday towels behind a decoratively embroidered panel gave evidence of a well-kept home and of the housewife's deftness with the flax wheel and the needle. In this example, a restrained design is composed of schematic urns and flowers worked in cross-stitch. Though the design is extremely refined, a lively decorative effect is created by the bright reds and greens used in the embroidery; the colors stand out boldly against the light natural linen background. Embroidery worked with loosely twisted yarn, called crewel, is known as crewelwork. Also known as "worsted" yarn, crewel was widely available in England by the seventeenth century, when favorable agricultural conditions produced robust sheep capable of growing the longer strands of wool required for this yarn. American crewelwork was inherited from Jacobean England. While the embroidery is generally less dense than that of English prototypes, English patterns were perpetuated in American designs. Coastal New England was the center of crewelwork activity on this side of the Atlantic. The needlewomen of New England purchased their yarn, as well as the fabric on which they embroidered, from England and generally followed English needlework styles. Crewelwork motifs were derived from painted and printed cottons imported into England from India during the seventeenth and eighteenth centuries. 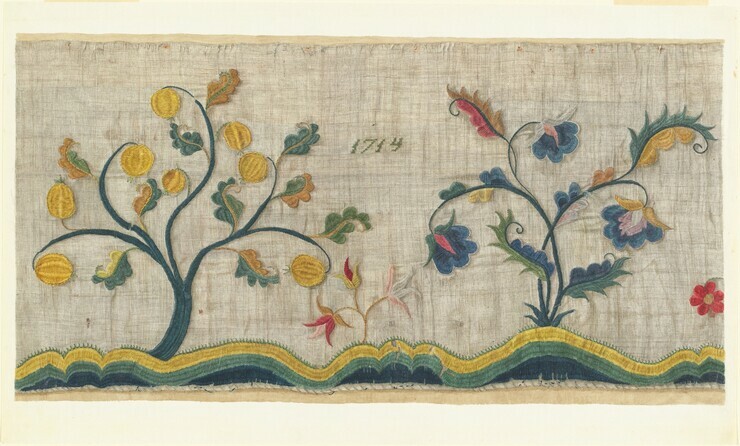 Typical crewelwork designs showed flowering trees rising from delineated hills, as in this eighteenth-century example made in Massachusetts. Exotic birds in scroll-like branches were also popular, as were floral sprays scattered irregularly upon the ground fabric, which was usually of linen plain-weave. This crewel-embroidered valance retains the luxuriant character of Indian designs in the forms of the exotic trees and in the rich combination of brilliant colors. Crewelwork decorated counterpanes (bedspreads), hangings for four-poster beds, valances for windows, chair coverings, or curtains for the home. In the early nineteenth century, American women often used their leisure time to embroider rugs. One of the most famous embroidered rugs is the Caswell Carpet, a portion of which is seen here. It was made in Vermont between 1832 and 1835 by Zeruah Higley Guernsey, who later married a Mr. Caswell; the rug is known by the latter name. The wool used in the rug was grown, spun, and dyed at home. Nearly eighty separate blocks were embroidered in a double chain stitch, or "Kensington stitch," on a coarse homespun foundation. Each block has its own complete design. While floral motifs predominate, diversity is achieved by modifying the floral forms and by varying their arrangement within each square. In some blocks, flowers or leaves stand alone; in others, they are combined with baskets, vases, birds, or butterflies. The overall design is further enriched through the inclusion of non-floral motifs such as kittens and puppies and, in one square, a bridal couple, believed to refer to the approaching marriage of the maker. 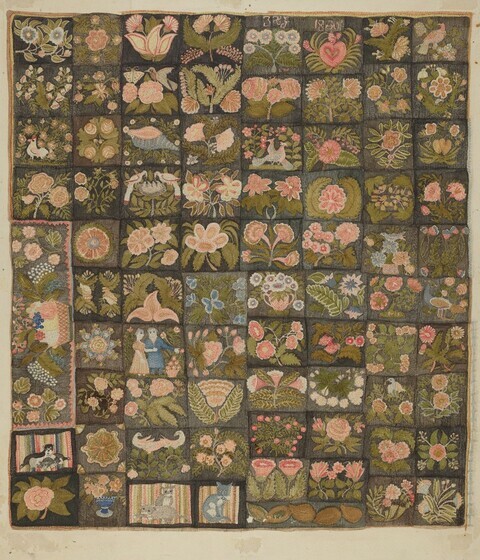 On one end of the carpet is a long panel embroidered with a sawtooth border and a central design showing a basket filled with flowers and fruit. During the summer, when the fireplace was not in use, this panel covered the hearth; in winter it was folded under the body of the rug, in order to leave the hearth uncovered. The presence of the hearth panel indicates that the rug was not made solely for decoration, but that year-round utility was also a consideration in its design. American women displayed a brilliant sense of design not only in embroidery, but also in hooked rugs, which were produced by housewives everywhere. Hooked rugs testify also to the homemakers' thrift, for the women made them from worn-out clothing that was cut into long strips. These strips were pulled with a metal hook through a coarse foundation such as linen or burlap. Frequently, discarded feed bags were used as backing. Each strip was looped on the surface of the rug and pulled flat on the reverse side; the process was repeated again and again to create a nubby surface of innumerable loops. At times the loops were clipped to achieve textural variation. Designs were usually bold and simple; geometric forms were used frequently, although flowers, animals, houses, and ships were also popular. Motifs were often combined; here a strong geometric border frames a floral bouquet. 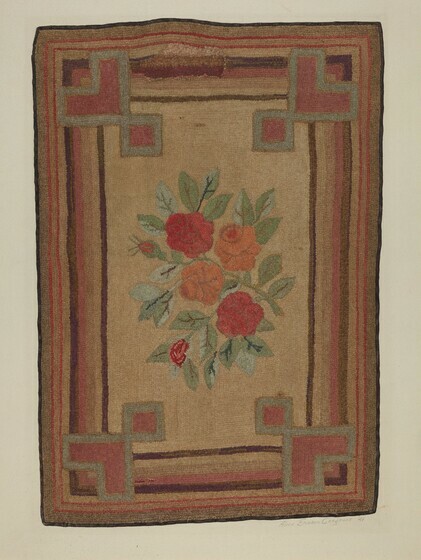 Generally a lively effect is achieved through strong color contrasts, as in this rug, where tones of gold set off the vivid reds and greens of the flowers. Reflecting the English and European fashions during the eighteenth century, printed cottons of all types were in great demand in America. Most printed textiles of the time were imported from England, since laws prohibited the manufacture and printing of fabrics in the colonies. By the middle of the eighteenth century, however, the colonists were defying the English bans, and cottons and linens were being printed openly by shops in New England and in the mid-Atlantic colonies. 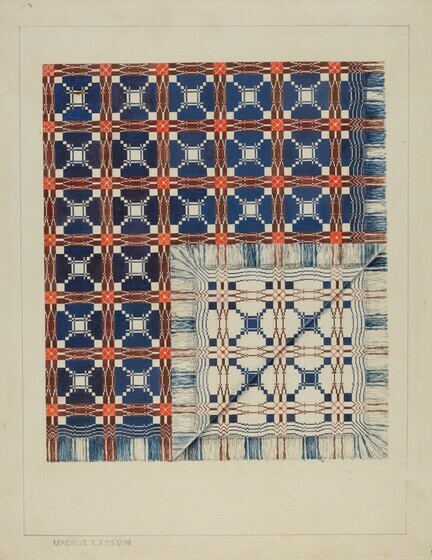 Early printed textiles, like this example, received their patterns through a technique of printing with wood blocks. A design was cut in high relief on a block of wood. Colored dyes were applied to the relief design, which was then stamped on the fabric, thus transferring the pattern. Along with historical scenes based upon American figures and events, floral patterns were popular. 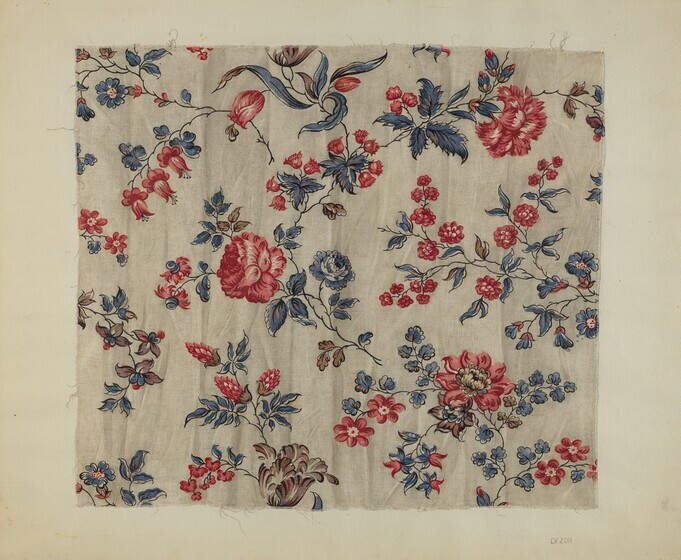 In this late eighteenth-century American printed cotton, the lavish pattern of brightly colored flowers recalls the elaborate designs of Indian fabrics and of their European counterparts. 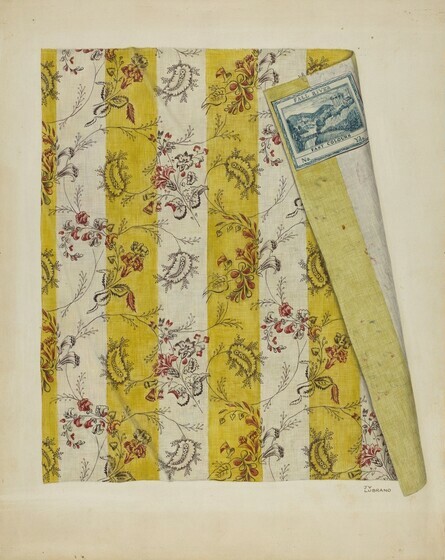 In America, commercial production of printed textiles was a profitable business by 1800. While the growth of the textile industry in America was encouraged by the availability of cheap cotton and by protective tariffs, mechanization was the key to an expanding textile industry. Mechanical spinning was introduced in Rhode Island in 1789, and the power loom came into use in 1814. With these machines American mills accelerated and vastly increased the production of textiles. The tedious wood-block technique gave way to the more expeditious process of roller printing, that is, using metal cylinders with engraved surface designs as the means by which patterns were transferred to fabric. By the middle of the nineteenth century, textile mills were flourishing throughout New England and the mid-Atlantic states. Fall River, Massachusetts, became an important textile manufacturing and printing center, and among the factories in that location, Andrew Robeson and Company was pre-eminent. Here is a cotton print produced by the Robeson Company between 1834 and 1848 and bearing the company's label. The fabric is woven in stripes of white and soft yellow. The striped design is overlaid with a floral pattern printed in black and red and reminiscent of the floral forms seen in Indian fabrics. The delicacy of the printed pattern is in keeping with the refinement of the colors and justifies the many awards the company received for the "fineness" of their products. American families needed warm bedding for the cold winters, so, in addition to woven coverlets, they made quilts. A quilt consists of two layers of material with wadding between; the layers are held together by stitches, often in a variety of patterns. The triple thickness of quilts provided bedcovers of the necessary warmth. 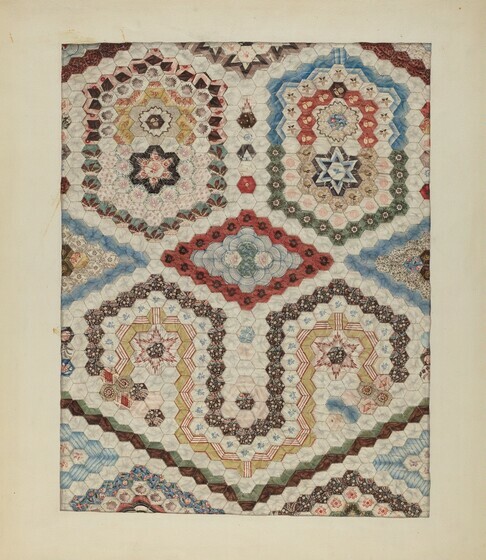 Their elaborate designs made quilts a focal point in the decoration of eighteenth- and nineteenth-century American homes. Patchwork, or pieced, quilts are distinctively American and provide another example of the thrift of American housewives. Although commercially produced printed cottons were available from the late nineteenth century onward, these fabrics were regarded as precious; every scrap was used, and pieces of fabric from worn-out clothing were carefully saved. From her scrap bag, the housewife took bits of fabric and cut them into geometric shapes. The geometric units were then pieced, or sewn, together in a pleasing design. The resulting panel was used for the quilt top. This quilt top consists of small hexagons painstakingly pieced together to form an overall mosaiclike design. In this type of pieced quilt, made about 1810, heavy paper was used under the patches in order to create well-defined shapes. The edges of the fabric were folded under the paper hexagons and basted in place. The hexagons were then pieced together to form the quilt top; careful attention was given to the placement of the colors in order to achieve an orderly and lively design. Patchwork quilts put together in random fashion are called "crazy quilts." The crazy quilt is the oldest form of American patchwork and evolved from the necessity for using every scrap of material. By the late eighteenth century, pieced quilts in geometric patterns had replaced crazy quilts; quilts displaying irregular patterns became popular again after the middle of the nineteenth century, when they were used as ornamental throws on couches in fashionable parlors. 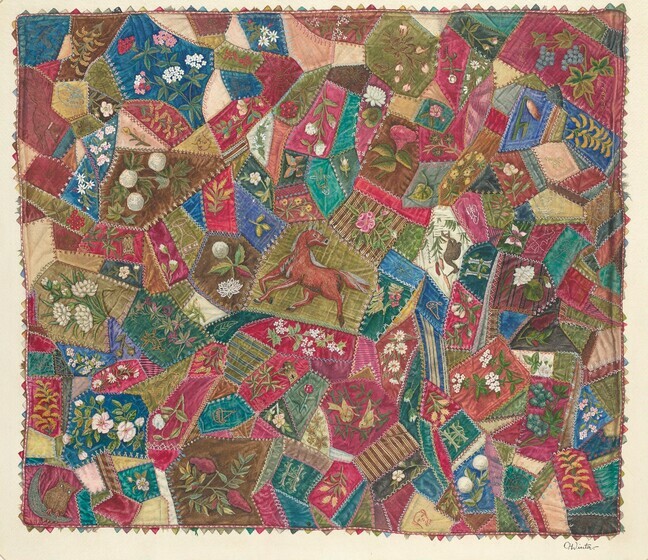 The crazy quilts of the late nineteenth century, unlike earlier quilts, generally included scraps of silk, satin, or velvet in addition to the customary cotton patches. The luxurious quality of the fabrics was emphasized by the manner in which the oddly shaped patches were pieced together. Unlike their earlier counterparts, the seams were sewn in elaborate embroidery stitches. This crazy quilt combines a variety of ornate and colorful fabrics joined by embroidery in contrasting hues. Additional ornamentation is provided by designs embroidered on the individual patches. 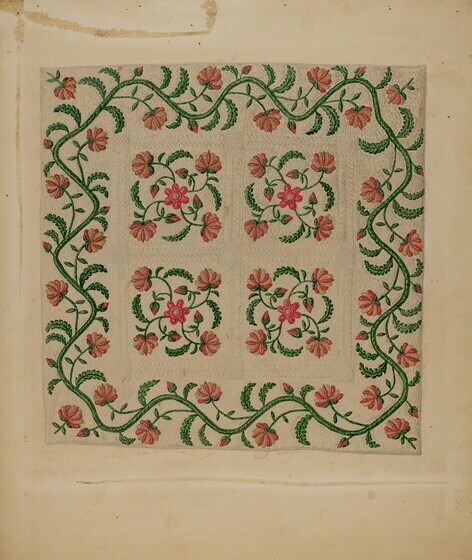 Supplementary needlework of this kind became fashionable shortly before 1850 and soon became a common method of heightening the ornamental quality of quilts. Along with pieced quilts, appliqué quilts were popular. In appliqué quilts, each element of the design was cut out, the edges turned under, and the pieces stitched to a plain backing, usually white muslin. This method provided for a wide range of decorative patterns. In addition to geometric designs, elaborate floral motifs were prevalent. Here is a meticulously crafted appliqué quilt with decoration based on a rose design, a common motif from colonial times through the nineteenth century. Brilliant reds, green, and yellows contrast vividly with the white background, producing a decorative effect of great gaiety. The design is well composed, with four floral groups disposed evenly in the square center, or field, of the quilt. A paneled effect is achieved by the quilting pattern -- a combination of shells and plumes -- that separates the floral groups and defines four subsidiary squares in the field. The entire field is surrounded by a continuous border of roses, repeating the form of those in the center. The fluid curves of the border echo the scrolling forms of the central flowers and of the background quilting as well. Here, appliqué decoration and quilting are perfectly balanced to create a design of outstanding decorative interest. In this detail of a mid-nineteenth century appliqué quilt, the elaborate quilted patterns attain a decorative importance equal to that of the brightly colored appliqué work. The quilting is a complex combination of motifs featuring scrolling flowers, feathers, and the American eagle. The quilting has been given great prominence in the overall design of the piece not only through density of pattern, but also through the addition of extra padding to produce a sculptural appearance. The sculptural effect was achieved by a special method of stuffing. The designs were first outlined with quilting stitches; then, by means of a long needle, cotton wadding was pushed through the coarse backing of the quilt. As a result the quilted design stands out in high relief against the background. In the early nineteenth century, women made elegant all-white quilts or coverlets decorated entirely with such "stuffed-work" designs. In this example, the raised stuffed-work design enhances the colorful appliqué decoration and adds greatly to the ornamental quality of the quilt. 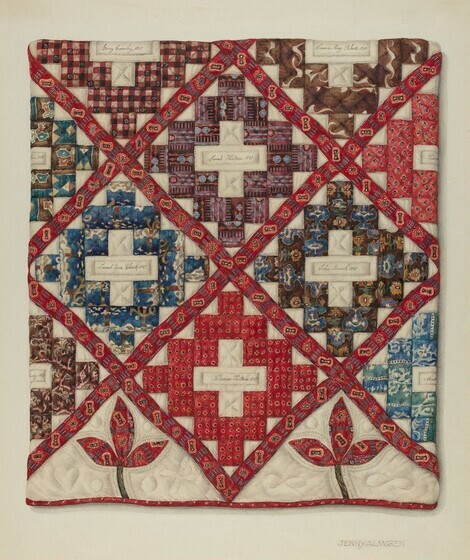 Pieced and appliqué quilts of the nineteenth century were often made from separate blocks sewn together and quilted by women at a gathering called a quilting bee. This was usually a festive occasion for the entire community. The technique of making quilt tops in individual squares led to the development of a special kind of quilt, known variously as signature, autograph, album, friendship, or presentation quilts, made for a special friend or event. 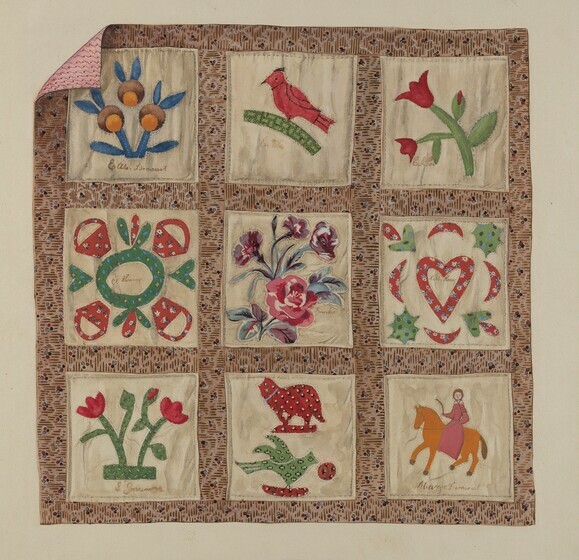 These quilts, popular during the 1840s and 1850s, were made from blocks donated by friends, who would gather at an "album party" to piece together and quilt the individual squares. As in this doll's bed quilt, probably made by a group of young people, each contributor appliquéed a design on her own square. The appliqué designs were often embellished by the contributor's signature in ink or embroidery, hence the term "signature quilt." Album quilts are characterized by their varied designs; here floral motifs are combined with animals, birds, and even a horse and rider. Unity depends upon compatibility of scale and harmony of color as well as upon orderly arrangement. In this example, the most complex designs have been placed in a row across the middle of the quilt; the simpler designs are at top and bottom. The calico neatly frames the blocks and creates a lively contrast of pattern against solid colors. Album quilts such as this one are records of cooperative efforts to honor a recipient or to commemorate an occasion; in their workmanship, patterns, and cultural significance, they are among the most interesting of American quilts.